A little reminder that the Annual Leesburg Airport Open House is this week-end. The open house will be going on from 10am to 4pm and the admission is free. If you want to see the show, but cannot for some reason go to the airport, a video stream of the event will be available on their website. Also be sure not to miss the WWII Hangar Dance with Radio King Orchestra. Apologies to all regular readers for the recent technical difficulties are in order. LeesburgTalk is hosted on a server in California and recently it underwent some hardware changes that seem to be interfering with access to this site occasionally. It’s also made it difficult for us to handle some of the remote administration functions. I’ve been assured that things are back to normal, so if you see the site behaving slowly or it appears to be off-line, please let me know ASAP. A stately mansion, beautiful rolling farmland, exquisite gardens, a repository of more than 200 years of American history and culture – all of these are just minutes from downtown Leesburg at Oatlands Plantation. Oatlands is flourishing with four full seasons of activities. Past visitors may remember seeing the beautiful irises, peonies and other spring flowers. The gardens looks very different now with late summer blooms including butterfly bushes, black-eyed susan and sunflowers. And the vegetable and herb gardens show what a kitchen garden might have been like a century ago. Special events coming up at Oatlands include a Sunday tea on August 30; the 15th Hunt Country Fall Antiques Fair on Sept 5 and 6; and the Oatlands Cross Country Invitational on September 26. And from August 24 -31 there’s a sale going on in the Oatlands gift shop: 30% to 70% off current merchandise. For information about these and other upcoming events, visit the website at www.oatlands.org. If the popularity of a restaurant can be measured by the lack of empty seats at lunchtime, then Anthony’s Italian Mediterranean Family Restaurant in Purcellville is a smash hit. We stopped in for a quick bite at high noon and saw the indoor and outdoor seats vanish in about 10 minutes as the lunch crowd rolled in. Anthony’s is on the west side of town (next to the 7-11 for people who know Purcellville) and this location has seen a lot of restaurants over the years. But the current owners seem to have hit on a menu and price combination that works well for everyone. The menu is pretty standard fare, with gyros, souvlaki, and subs. Entrées include various pastas and pizzas, strombolis, and calzones are all on the menu, too. We decided to try the Souvlaki Sandwich and the Chicken Shawarma sandwich. Both were served piping hot, wrapped in a pita and rolled in foil to make it easy to eat. A side of battered fries came with each sandwich. The souvlaki was big chunk of well-seasoned chicken, lettuce, tomato, onions, feta, and olives. The shawarma was slices of chicken with the same veggies and tahini sauce, which added an interesting twist. The service was prompt, especially given the crowd, and the food was tasty. It’ll be interesting to go back and try the pizzas, pasta, and calzones for dinner. Two lunch sandwiches with fries and a couple of iced teas came to about $10 a head, which is not bad for a sit down lunch. They are open for lunch and dinner every day and you can find Anthony’s at 620 West Main St. in downtown Purcellville. Again, thanks to Irene Mandracchia, the Garden to Table group and the Demonstration Garden leads for providing this information! This week in the Master Gardeners’ garden at Ida Lee Park in Leesburg the Master Gardeners have been dealing with this excessive heat wave by watering very generously. This watering, done deeply (thoroughly saturating the soil, but avoiding run-off, which is wasteful), helps plants cope with the very high temperatures we have experienced recently. The Master Gardeners are also harvesting watermelons (which they are growing on a trellis) and tomatoes. The cucumbers and squash have slowed down in production, probably due to the excessive heat. The bean beetles have destroyed a bed of bush beans and they have been removed and a new bed of bush beans has been planted (it is still not too late to plant bean seeds for a late summer/early fall harvest). Be sure and keep your vegetable beds as weed free as possible during this time of year as weeds can steal moisture from your vegetable plants. In the ornamental beds, now is the time to cut back your lavender plants. If you have not grown lavender before it is a very easy and delightful plant. If you prune it back after flowering right from the start you can keep it from getting woody and unsightly. Cut the plant back to about 4 inches from the stem and harvest the flowers and rubber band them together and hang them to dry.You can use them for in sachets or as dried flowers. Cannas are getting ready to bloom. Be sure to “dead head” (remove spent flowers) from your ornamentals if you want to keep them flowering. Happy Gardening and if you have any questions about this information, or have any questions about gardening, please contact the Master Gardener “Help desk” at 703-771-5150 or email us at ex107mg@vt.edu . This week’s round-up is about very different choices, but all full of flavors. Our first outing was to the Indian Restaurant and Grocery situated at 525 E. Market St. in the Bellewood Commons. At the time of our outing, the lunch buffet was not set up, so we decided to take a look around the grocery section. Being fans of Indian food, we were really happy to discover that this little grocery had tons of specialized ingredients: beans, lentils, spices of all sorts, etc. We bought a spice mix to make butter chicken at home. It gave excellent results. We will have to go visit again to see how the buffet is, but the Indian Restaurant and Grocery store is definitively a must go if you are shopping for Indian ingredients. Also, it needs confirmation, but it looked like they had some Bollywood movies for sale. 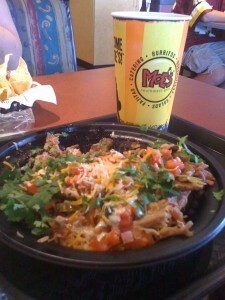 Our second suggestion this week is Moe’s Southwest Grill situated at 667 Potomac Station Dr NE. For being part of a chain, the food was surprisingly good. After being greeted by the traditional “Welcome to Moe’s” yelled by all employees when someone comes in, we picked a ground beef taco meal and a pork salad from the menu. Both portions were huge and the taste and spices were excellent. The taco was so full of meat, guacamole, salad and pico de gallo that I had a hard time not getting any all over my shirt. The pork salad is made with pulled pork meat and was dressed with our choices of ingredients : cheese, pico de gallo, beans and cilantro. Of course it did not replace a trip to New Mexico or South Texas, but it was good southwest food for Northern Virginia. Finally, we made a nice discovery during our First Friday outing. We sampled some of the products (apple cobbler, beignets, hushpuppies and cornbread) from Woodpecker Farm Foods. This Virginia company was founded in the early ’90s by the great grandson of Betty Washington, George’s sister. The gourmet batter and dough mixes are made with simple, natural ingredients. You add a little water to the mix, stir, bake or deep fry and voilà! Their products, very affordable (between $3.50 and $4.50 a bag) can be found at The Pink Shop or online. Tonight is National Night Out, where neighbors come out to meet their neighbors, their local police, and have a good time while helping to reduce crime in their neighborhoods. The Leesburg Police Department is sponsoring several events around town tonight, starting at 6 PM at the Crossroads Baptist Church at 850 Edwards Ferry Rd. and moving to the Greenway Farms Pool House (55 Meade Dr. SW) at 8 PM. There will be events for kids including a moon bounce and barrel train rides and lots of info for adults on how to reduce crime in your neighborhood and keep your home safe. Nearly every neighborhood has some event planned, so check with your HOA to see what’s up. Did you ever wonder if that recycling you put onto your curb, with all of it’s mixed up goods, was actually sorted and passed along the recycling food chain, or are you like many residents who believe that the material is simply sent along to the dump with the rest your household trash? While it’s true that the recycling is picked up using the same trucks as are used on garbage day, believe it when I say that the recycling is sorted and distributed. Friday, the Environmental Advisory Committee of Leesburg attended a tour of the CSI recycling facility in Sterling. What is in it for CSI to actually sort and recycle? 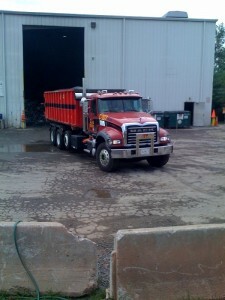 The single largest cost for trash haulers is the fee at the dump. This is why many places spend the gas to take trash to areas outside of the county. 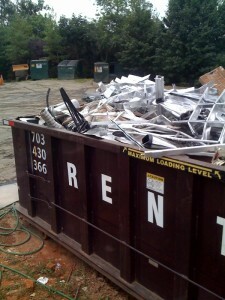 Most of your trash does not end up in the Loudoun County Landfill. Believe it or not, hand sorting the recycling is much less expensive than the dump fee – and the sorted product brings in money. The CSI facility is basically a warehouse – the trucks arrive hauling 900 houses worth of recycling, they dump it onto the floor of the warehouse where it is then hand sorted into piles. Cardboard is thrown flat onto a conveyer belt which hauls it to a baler. The bales of cardboard are then stacked ready for freight shipment to North Carolina – ready to be turned back into a paper pulp slurry. 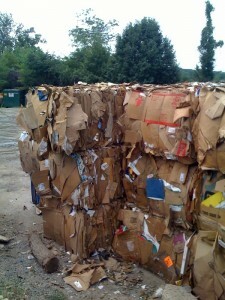 Generally, the recycled cardboard is used to make low grade products such as the corrugated section (wavy middle) of new cardboard. Metals are sorted, compressed, and sent via train to places like Kentucky to be smelted and reused. Glass containers are reused, versus recycled, or sent to the landfill where they are ground up and used as roadway material – a much cheaper alternative to gravel. Plastics are grouped all together and sent to processing plants which further separate and recycle. Many of the plastic bottles you use daily are made into carpets and clothing. What about plastic grocery bags? CSI sends them along with the other plastics, but generally, they are disposed of at the secondary sorting site. The best bet to make sure your plastic grocery bags don’t end up in a landfill somewhere is to take them to the Giant who has a contract with a company specifically set up to recycle these bags. Better yet, remember to take your reusable shopping bags with you when ever you have to shop! In fact, our CSI spokesman, Paul Williamson, made the comment that the best way to “recycle” is at the source – reduce your packaging and waste at the source, and avoid having material to recycle. A great web site which has a wonderful selection of reusable bags is: http://www.reusablebags.com/ My favorite are “Envirosax” bags – they can be purchased in a set of 5, fold down into a small billfold sized packet, and are strong enough to be filled to bursting. ReusableBags also has a good selection of alternatives to plastic bottles. “Sigg” bottles are great as they are lightweight aluminum and lined so they are resistant to bacteria and don’t carry a taste from a previous drink. The great thing about buying a “named” product such as Sigg, is the ability to buy replacement caps. Ours have been thoroughly tested in a year of school lunches – they’ve been drop-kicked and generally abused, but will certainly last another year, dents and all.